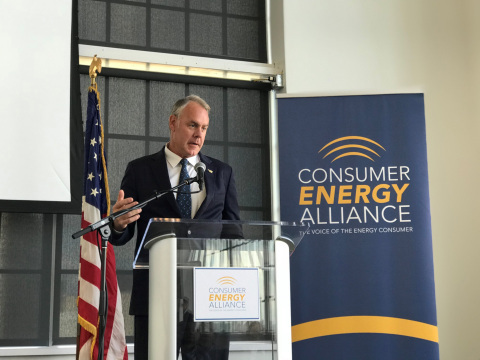 Domestic energy production and development in the Marcellus and Utica formations continues to be a driving force of American energy dominance, benefitting the wallets of all Americans, businesses and the environment, U.S. Secretary of the Interior Ryan Zinke said today at an energy and manufacturing summit in Pittsburgh, hosted by Consumer Energy Alliance (CEA). "President Trump has been clear: America has to be energy dominant," Secretary Zinke said. "We have re-lit the pilot light of American energy under this President. We are incorporating industry innovation, best science and best practices to improve reliability, safety and environmental stewardship. Our energy strategy is 'all-of-the-above,' leveraging every source of energy to take our nation forward. I am bullish about America's energy future." “Federal tax and regulatory reform have reinvigorated the national economy and following up those historic reforms with pro-growth policy at the state level will cement our state’s competitive advantage for years to come," Sunday said. "The billions of dollars in midstream investments being made by Dominion Energy to help get natural gas to hungry markets at home and abroad ripple through the region's economy providing jobs, local tax revenues and opportunities for many small and midsized businesses,” McKay said. "A prime example is the $400 million worth of pipe made by Pennsylvania workers at Durabond Industries for the Atlantic Coast Pipeline." "The working men and women who depend on regionally-made, lower-cost energy to affordably and efficiently produce the materials and steel that keep them employed are thankful for what the Marcellus Shale has provided them – a chance to stand together and work toward achieving the American dream,” Kelly said. Astilleros y Servicios Asenabra S.A.
Steckerl Hierros y Aceros S.A.